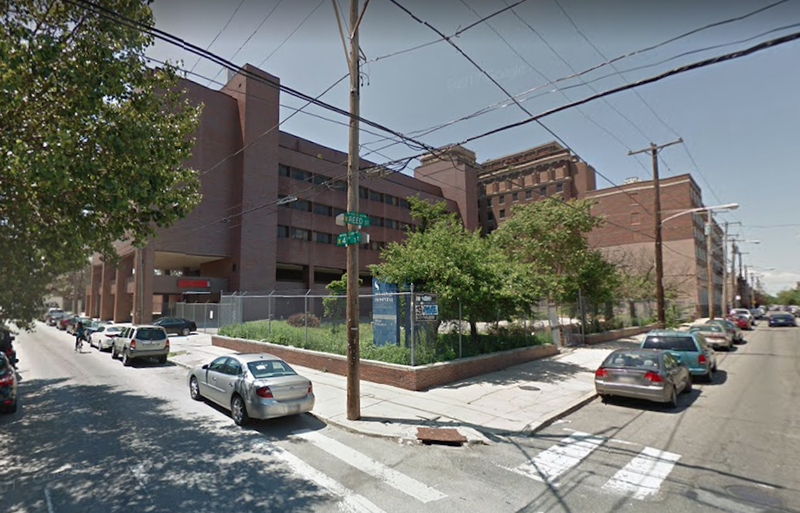 Mount Sinai Hospital occupied almost an entire square block at 4th & Reed, which made it especially troubling for the surrounding neighborhood when the hospital closed its doors in 1997. Since then, the hospital sat vacant and unused, with the exception of a section on the western end of the 400 block of Reed Street which was converted to senior housing. Over the years, various developers considered potential reuse opportunities for the former hospital, but nothing ever came to pass. In the end, reuse proved either impractical or economically undesirable, as Concordia Group tore down the old hospital and pursued a massive town home development in its place. 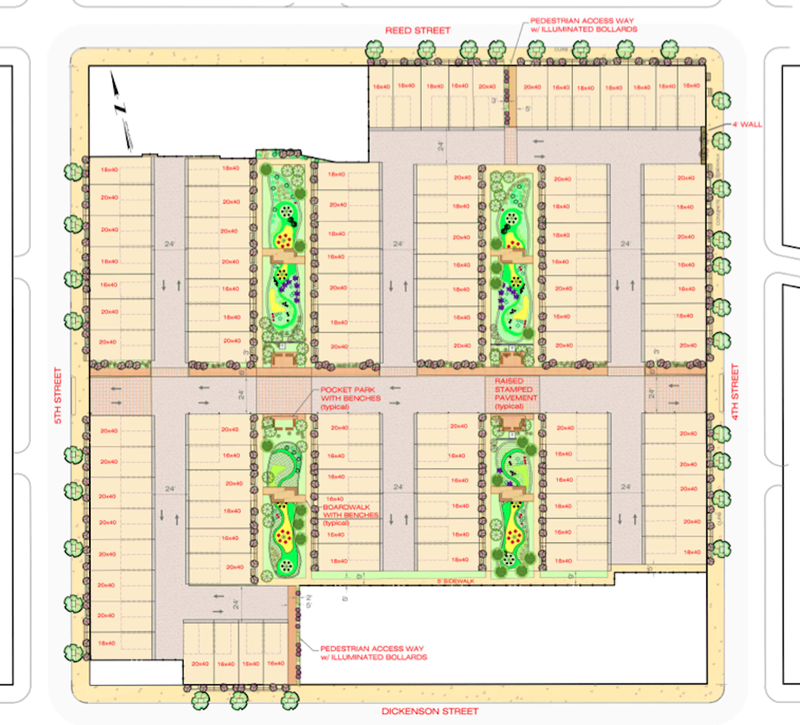 The development is called Southwark on Reed, for those that aren’t aware, and includes 95 homes with frontage on all four block faces and inside the development as well. Construction began before demolition was even finished, and when we checked in on the project a little over a year ago, roughly 14 homes were finished and another dozen were under construction. The project offered four home varieties, ranging in width from 16′ to 22′, with prices starting just under $500K and reaching the mid-$600K range. At that point, 36 homes were already sold or under agreement, which indicated to us that people were excited by the project and undeterred by the price points. 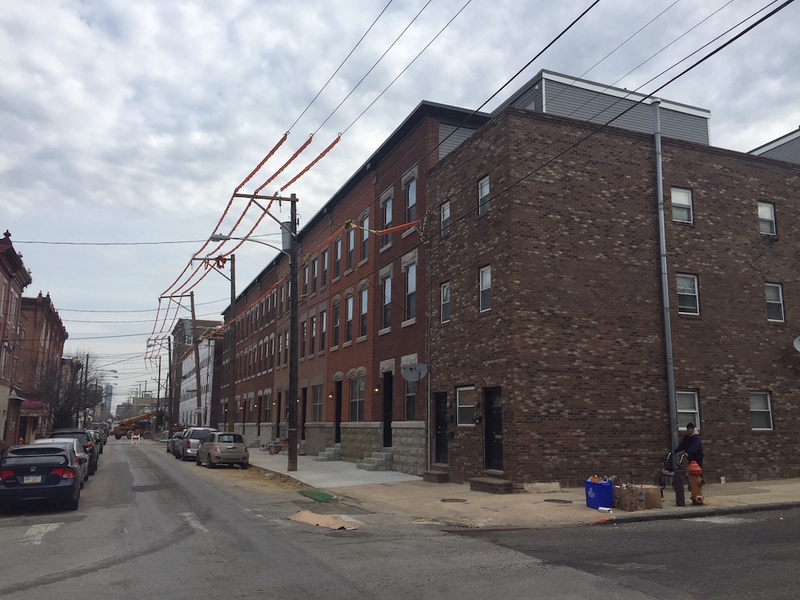 Checking in on the project the other day, we realized that construction is rapidly approaching the finish line. 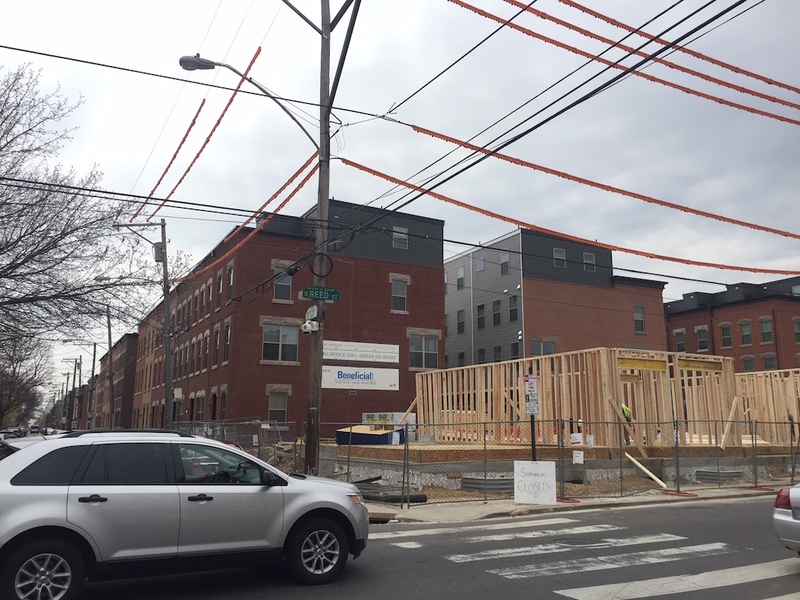 At this point, as far as we can tell, some of the homes on 5th Street are still getting finished, while the homes fronting Reed Street are only in the framing stages. Still, that’s some staggering progress in a relatively short time frame. What’s more, according to the project website, the development is completely sold out. Holy smokes. We would have probably preferred seeing the old hospital reused rather than demoed, but it’s clear that the project that’s appeared in its place has been a major success story. A project of this size brings with it a ton of risk, as later phases of construction are often contingent on the sales in the initial phases. Given the speed at which the homes have gone up and sold, those issues didn’t come into play here. Credit to the developers for coming up with a plan that the community found acceptable and buyers found incredibly desirable. 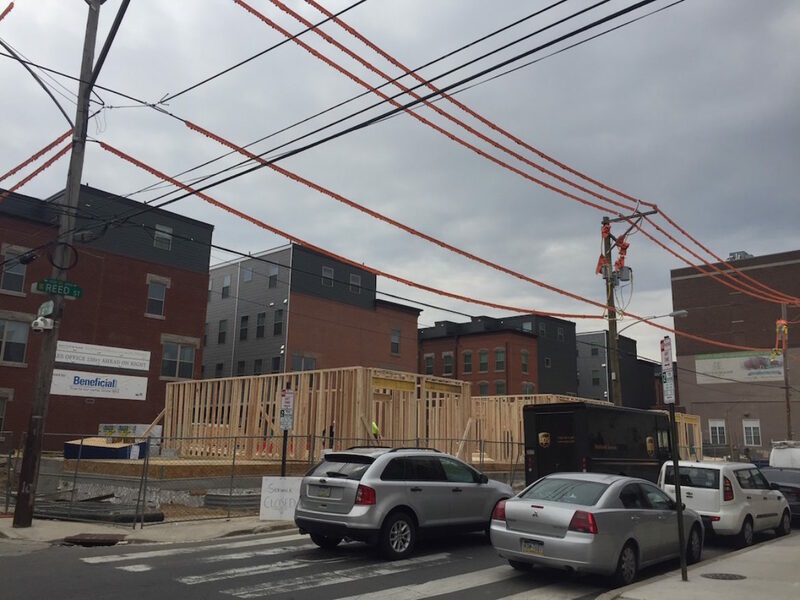 By the time the project wraps construction in the next few months, Pennsport will have added a couple hundred new residents, bringing new life to a previously lagging block. We wonder, given the influx of new neighbors, whether we’ll see some new businesses open in the area. In the meantime, we imagine the lines at Grindcore House and the Dutch are a little longer than they used to be. Really short sighted to create 100 new homes and zero new retail. Love the traditional facades. These will have much greater longevity than metal clad bay windows, which are often unappealing the day they’re finished! It doesn’t look like the perimeter of the project has any of the trees promised in the plans shared here. Aren’t those trees required? They chopped down at least 2 100+ year-old Sycamores on 5th street. Love the extensive use of bricks on the outside and how it helps blend the new construction in with the rest of the neighborhood. Glad to not see any metal, bland grey, boxy stuff for once. 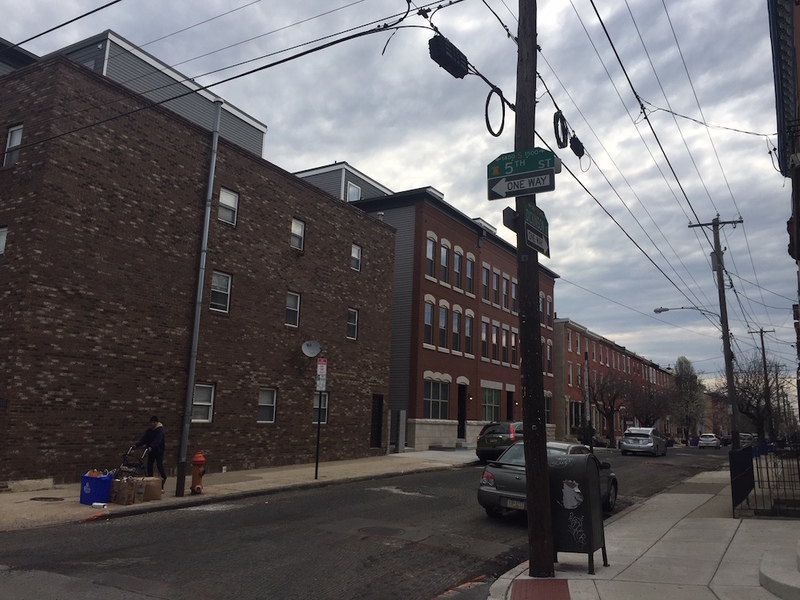 The detailing on the street fronts looks good, certainly a long way from the South Philly special of a few years ago (stucco everyplace). I don’t know how it could have been done, but I wish this wasn’t such a car centered plan. Just think about what it might have looked like if all the parking was below grade and the present parking strips would have been green instead of pavement.